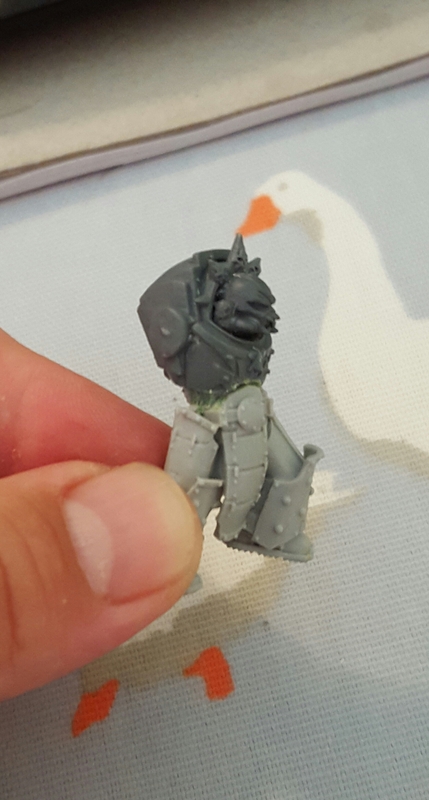 So today I spent a bit of time putting the terminator lord together. I’ve added a few photos to show the details as I discuss them. The principle of pinning is used to ensure two or more parts that may break apart are sufficiently glued together. For newer people to the hibby that might be reading this, if you glue a large metal arm to a creature that always seems to break off or just refuses to gluw together this applies to you. Pinning is also used for a variety of different reasons, for example attachig a heavy metal piece to a plastic/resin model, making a banner haft that stays on the model or forming an area between 2 pieces that can later have additional material added, most commonly greenstuff. Other uses of the technique can be used for say, using as the haft of a long weapon where the end of the weapon is plastic or metal. For the lord I needed to pin the resin legs to the plastic body mainly because the body is designed to flush fit the terminator legs. The resin legs I had were flat at the top meaning they’d be an insufficient bond between the two. I started by selecting a sturdy rod and cutting it down to size. The length was determined by having around 10mm inserted into either part of the model with another 5mm to fill the clearence inbetween. The thickness of the rod was determined by the fact I only had two sizes. 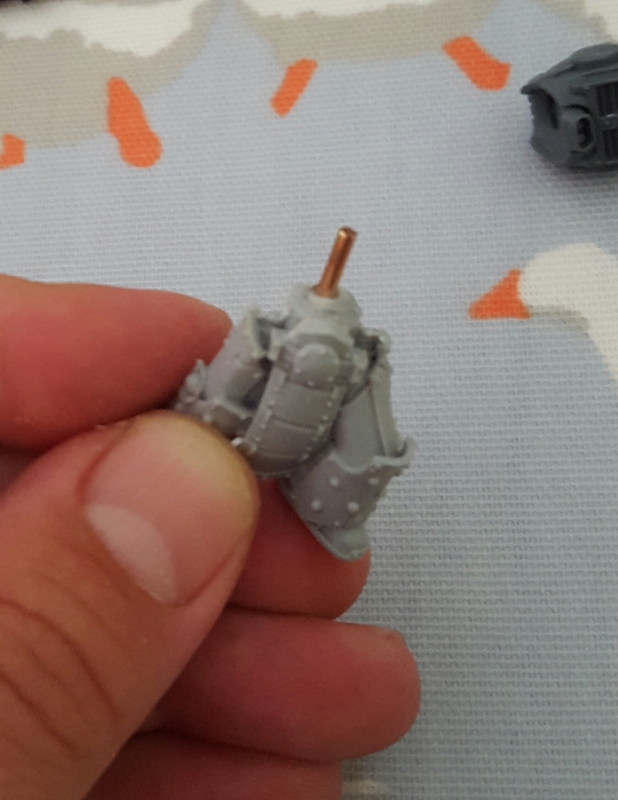 If you look at the pictures below the size was overkill for the purpose, I wpuld normally use a rod thickness shown to attach say an arm to a daemon prince. A large metal model. I then selected a drill bit that was slightly larger than the rod thickness to give me some ‘wiggle’ space when putting the two together and also fill the remainder of the hole with glue. 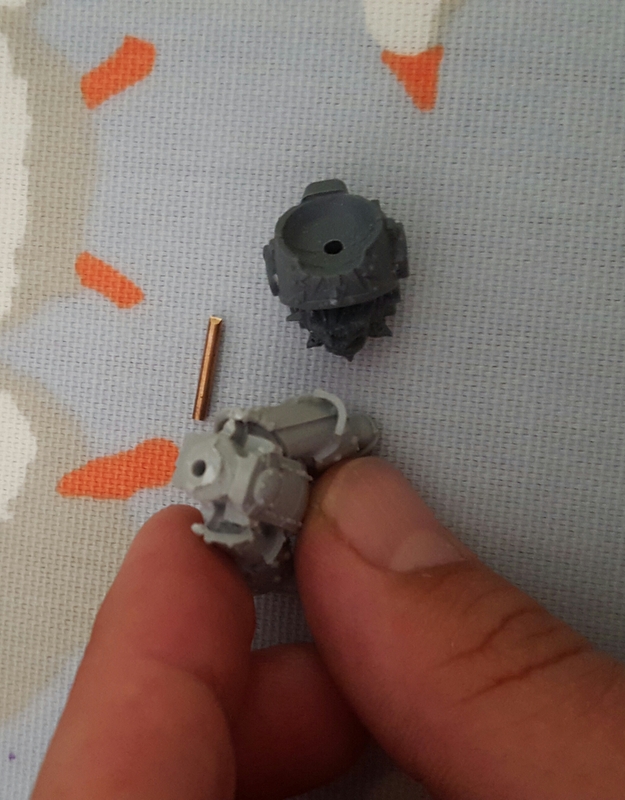 I then drilled a hole in each part of the model. Worth nothing another technique here. When putting two pieces together,paint a small splodge on one part and then fit the two pieces together. Some of the paint should then transfer onto the second piece givig you a guidance hole so the two holes and therefore the rod fits snuggly. I then added superglue to the hole in the legs and inserted the metal rod. The next stage was to fill the gap between the two parts before they qere stuck together, mainly because the access inbetween was difficult after the two parts were together. I rolled up some greenstuff whilst the glue dried and put this over the top of the rod. The action of sliding the body onto the rod would push the greenstuff down filling any gaps. 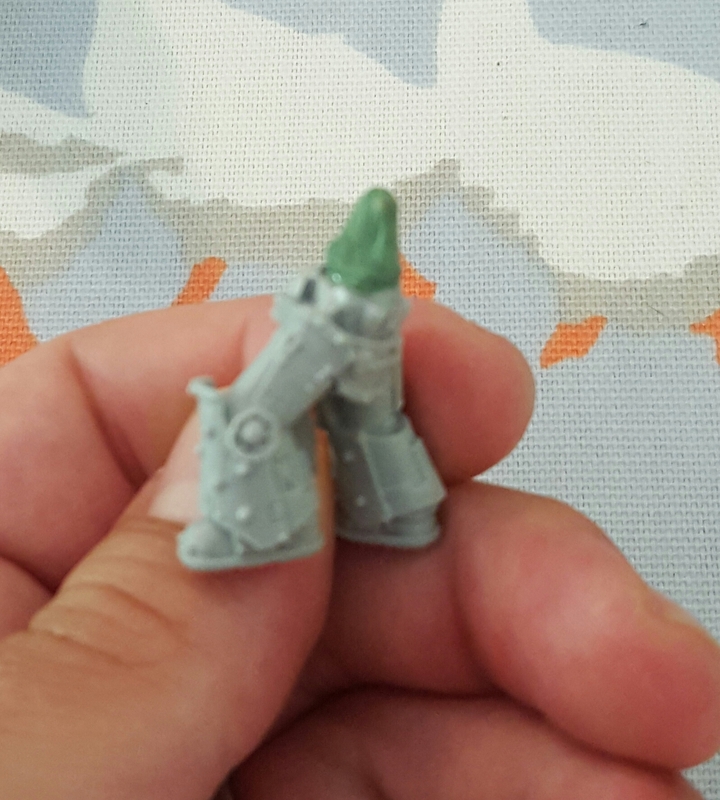 Normally if I was pinning say an arm to a body I would superglue one part with the rod inserted and press a very small thin layer of greenstuff onto the part and then push the arm on. This will ensure a bond between both pieces with no gaps. I then liberally added more superglue to the greenstuff to make a nice joint with the body and pushed the body onto the rod. Leaving this to dry will then give a joint between the two halves that would require one hell of a job to break apart. Once the two halves were together, I scraped away any excess greenstuff that oozed out the gap. Once dry I used a knife to then cut away any greenstuff missed on the first pass. Next time onto the arms.